*One pair of gold shoe buckles on black faux leather plate with elastic strap for under foot. Suits wearing over black shoes. Available in Gold and Silver, see separate listing. 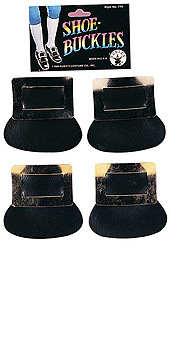 Spruce up your Colonial Costume with a pair of easy fit shoe buckles. Attaches to any pair of closed shoes for that authentic Colonial Style.